I’m not a writer. So why do I blog? Some days I have no idea. I started this blog just shy of one year ago after discovering a beauty blog. She also happened to receive Birchbox, and thus my love obsession with beauty subscription boxes began. I started writing reviews as an “easy” way to share a part of myself with the rest of the world. Shortly after that, I realized I wasn’t really enjoying that. I wanted to do more, write more, and share some of my other passions. For me, blogging is a different type of creative work from what I do during my 9-5. No one tells me what time to show up for blogging. I’m not supposed to write about anything in particular here. If I have an off day (like last night when I fell asleep on the couch at 9pm…yeah, I’m cool) no one gets upset about my lack of productivity for that day. But with blogging comes a lot of negative energy. Don’t write too many sponsored posts. Don’t associate with the wrong bloggers. Don’t complain too much. Be honest, but not too honest. Don’t sell out. Regardless, I think the positive will always outweigh the negative. I will be happy if one person reads my blog. Sure, I like positive reinforcement as much as the next girl, but really, this is for me. This is my outlet. This is a community I’ve decided to join to hopefully share positive parts of my life with the hope that I will inspire someone else to try something new, or to think differently. 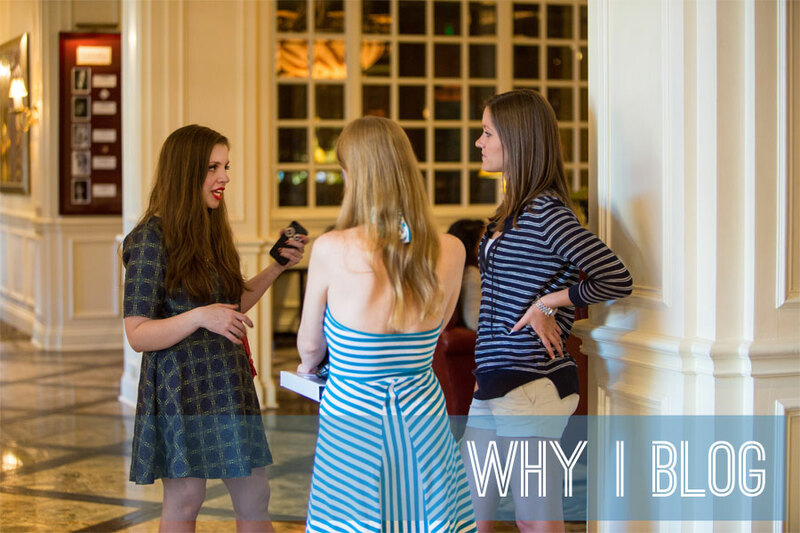 So if you’re a blogger, why do you do it? If you’re not a blogger, what is stopping you? Oh I LOVE that expression! An outlet for your “feminine creative energy”. Haha yep, exactly! Men don’t generally have a huge interest in makeup or fashion (which is obviously fine) but its nice to be able to share it somewhere! this is the best reason for blogging that i have ever read. or rather, it is the one that has resonated with me the most. i never knew why i blogged, because i was a bit lonely, but why? an outlet for my feminine creative energy is brilliant and so true. thats exactly why i do. i blog to talk to other like minded women, whether its about clothes, or books, or just thoughts on my mind that my husband, or even my in real life friends dont understand. brilliant. Yeah, I feel you on the “lonely” part. It’s hard sometimes to connect, even if you do have plenty of people around you in real life, sometimes they just don’t share the same interests or opinions. I love how you explain it! I blog because I love to write and I need a daily creative outlet. Blogging provides that and has made me more confident in my abilities as a writer. I love this post, and how you say your blog has changed since you first started it (from reviews, to something more “lifestyle”). I’ve blogged on and off for years, but what seems to keep bringing me back is the community. I love being able to share my opinions with the world, and to talk to other people about those things. I also love getting to see the opinions of so many very different people. Totally agree with you Kiersten! It’s really refreshing to learn and grow from other bloggers! I like to think the positive outweighs the negative too. I blog as a way to keep busy! Wow…you said what’s in my head!! I blog because it’s great therapy and cheaper than going to the mall. Ha, that’s so true Merrily! I’ve actually been blogging in different spaces for a really long time (since the late 90s) and I don’t remember why I started. Because I like the sound of my own voice? :P But I started writing a blog about beauty and that stuff a year and change ago because none of my real-life friends really care about that stuff at all. So I guess it’s a space for my “feminine creative energy” too, hehe. My site has evolved a bit too in terms of the content. I think that’s only natural when there’s one person running the show! I blog because I was spending SO much time on other blogs, when I could be spending time on my own! and I love the creative outlet! I was doing the same thing, and it really is a great outlet! Blogging is the perfect outlet for all things creative that have been pent up in me for far too long. And the community, I love these girls!! Sure there are things I dislike about it, and sometimes it is annoying, but I love it and can’t imagine my life without it. I totally understand about blogging being a creative outlet. I work in the finance industry – so being able to come and create and think in a completely different way is fun for me – and I am sure it’s good for my brain! You gotta do you. Regardless of the “rules”. I blog because I love the community, and I love learning. Agreed! Those are the reasons I keep coming back too. I love the “feminine creative energy!” I definitely blog because I love learning new skills and making new friends! I think thats a great reason to blog!